I've tried adjusting the high pot up to 255 (Adam suggested tweaking it) with the same results. Any suggestions on how I could investigate the token further? Thanks for the reply. When I run the 'plot' command, the graph I get with these tags is the same as if there's no tag on the reader at all. Adam said this was because of the nature of Hitag's START_AUTH process, but I'm a bit confused why the UID command doesn't return anything. Perhaps it's not Hitag2 after all? Not sure how I'd make the determination though. note that you need to be running the latest version to set pots in volts! OK, the problem is that the coil is not coupling well due to the size of the tag - you may need to wind a dedicated smaller coil for tags like this... RFIDler works fine with their larger tags, and I can actually get a reasonable result with these small ones by holding them at a right-angle to the standard RFIDler coil (i.e. if the coil is lying flat on the table, stand the tag on it's end in the centre or even up against the coil). Yes, you're quite right - the card and disc format tags give a much more sensible plot, and I was able to get the smaller tags to work by following your suggestion of holding them at right angles to the coil. UID didn't work, as you said. Can I get RFIDler to intercept an exchange between a tag and its reader in order to sniff the TAG and RWD passwords? I have a tag that looks very similar to those Paxton ones and only gives a meaningful plot when in Hitag2 mode, though I can't do anything reliably. When in ASKRAW mode, even with all of the other options set the ame as in hitag2 mode, the plot does not register any activity from the card at all. I thought that I should at least get some sort of noticeable waveform? - what other changes doe the hitag2 mode do? You say to wind a smaller antenna. Are there any guidelines for this - does it need to have a specific number of turns for example? Hitag2 only transmits when it gets a command from the reader. For the coil, it needs to have a specific inductance at the chosen frequency. Chip Monkey is working on a mod for the board that will help you measure that. Thanks for the reply; I'd love to be able to intercept an exchange. Getting the UID command working with the Paxton fobs is also of great interest! Getting closer - I can copy all the fields of a password-mode Hitag2 fob into the VTAG. Does emulation work for this kind of tag? Running the EMULATION command and then waving the coil around a reader doesn't seem to do anything. Does the VTAG need to know the PWD somehow? No, emulation for Hitag2 is not yet implemeted, but is certainly feasible. Im working on sniffing a Hitag 2 password too. Could you tell me how you got the pwd read alecw? Has the Hitag 2 emulation been implemented yet? 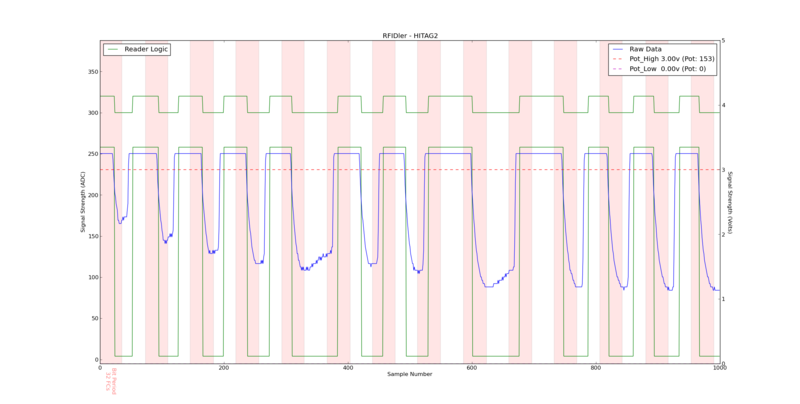 The above is a sniff of an external reader getting the UID from a HITAG2 which can clearly be seen in the last 5 pulses: 2 long, 3 short = 11000 = "START_AUTH". Is it committed? I'll test it out if it is. It is now. I've only created a decoder for HITAG2 so far, but I'll work on adding anything else that uses PWM. I've also changed the name of the command to "SNIFF-PWM" and it takes an optional argument which is the minimum gap size to look for in uS. Default should be fine for HITAG2. Hmm, which firmware do I put on the board? The one in debug/production, or the one in default/production? I compile and commit both whenever I do an update, so it's up to you. What's the physical arrangement of coil/RWD/TAG when sniffing PWM like this? All I've managed to get so far are 1's? The differences between debug and default can be viewed by flipping between them and viewing the project properties in MPLAB X IDE. It's mostly to do with debugging symbols etc. The physical layout I used for testing was sniffer coil, tag, reader coil using two RFIDlers. I also used a Paxton MultiFormat desktop reader with the sniffer coil underneath the reader and the tag being placed on top. Wow great work, Thank you a lot! Adam, will there be a decoder for HITAG1 too?